Sixty-four pro-abortion protesters who were opposing a bill by North Carolina's Republican-controlled government that seeks to limit access to abortion clinics were arrested on Monday in Raleigh. Calling it "Moral Monday," the protests, which have focused on different issues, are now in their tenth week, Reuters reported, with last night drawing one of the biggest crowds of about 2,000 people. 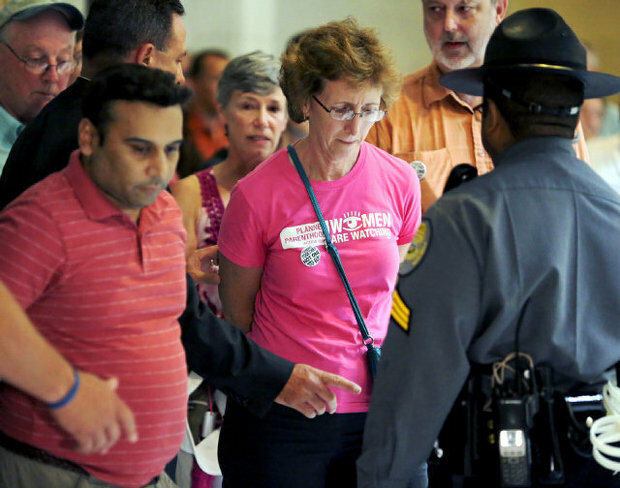 The 64 that were arrested had refused to leave the legislative chambers – one of them was Janet Colm, president and CEO of Planned Parenthood of Central North Carolina. Last week North Carolina senators passed a bill requiring clinics to conform to the same safety standards as ambulatory survey centers, according to The Nation. The law, passed in the Senate by a 27-14 vote, is scheduled to be voted on in the state House of Representatives on Wednesday. Republican Governor Pat McCrory promised during his campaign that he would not sign into law any restriction on abortion laws but, even if he keeps that pledge, the bill could pass without his signature. According to the Raleigh News Observer, there are currently four Planned Parenthood clinics in all of North Carolina. The new safety standards, which Democrats have described as a sham meant only to cut access, could reduce the number to one because of expensive licensing fees and doctor requirements.